CLEMSON -- For Clemson basketball to find itself back in the win column in ACC, it was rather simple. 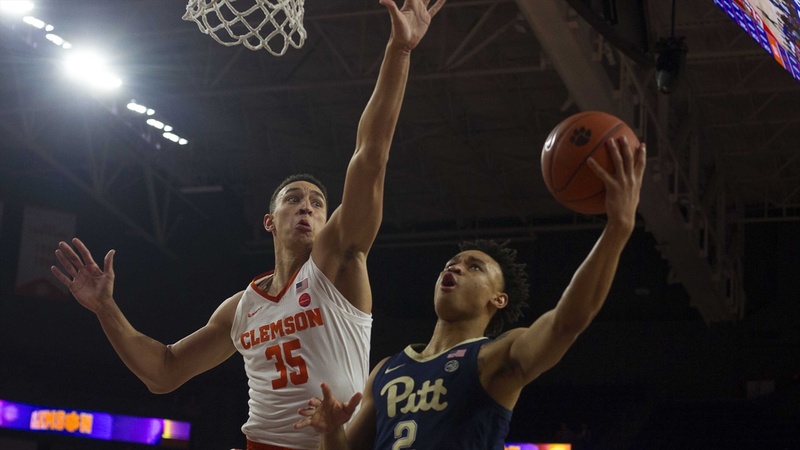 After Clemson struggled to put the ball in the basket in a heartbreaking loss to the Wolfpack on Saturday, shots finally fell into place on Tuesday night as the Tigers rolled over Pittsburgh 82-69. Clemson (12-7, 2-5) used a 51-point first half to bury the Panthers early. The game started with a 22-5 run for Clemson to build the comfortable lead. And Clemson seemed to be making everything. After failing to make a three-pointer on the road against the Wolfpack (0-for-7), the Tigers hit their first four three-point attempts against Pittsburgh and made nine total in the first half. At one point, the Tigers were 8-for-10 from behind the arc. Clemson led by as many as 29 points in the first half and led 51-23 at the break. It was tied for the most points scored in the first half Clemson has scored in the Brad Brownell era. The Tigers came into the contest only making 26 threes in conference play (26-of-94). But against Pitt, Clemson made 14-of-27 (52 percent) to right the ship. Marcquise Reed led Clemson with 26 points. It was a tremendous bounce-back game for the senior guard and leading scorer on the team after he missed four consecutive free throws in crunch time against N.C. State. He was 6-for-6 from the free throw line on Tuesday and was 8-for-13 from the field. Brownell said that as soon as Reed got back from Raleigh, he was in the practice gym for “a while” shooting free throws. Everything began with starting point guard Shelton Mitchell. Coming into Tuesday night’s game, he was two for his previous 19 from behind the three-point line in ACC play. By halftime, he had his game total of 14 points and was 4-for-4, not missing a shot in the first half. It was a good sign for Mitchell to finally find an offensive groove, as he was the motor that got Clemson’s offense going with his five assists. His performance earned himself a standing ovation from the home crowd as he left the game late in the second half. The Tigers shot 55-percent from the field and out-assisted the Panthers 17-2. The bright spot for the Panthers was Xavier Johnson, who had a game-high 30 points and helped Pittsburgh close the game with a 13-0 run in the final four minutes. Clemson also got plenty of help from its bench, which outscored Pittsburgh (12-8, 2-5) 26 to 16. Javon White had 10 points in 16 minutes and was 4-for-4 from the floor. Clyde Trapp was second on the team in scoring with a career-high 16 points, shooting 4-of-7 from behind the three-point line. You knew it was Clemson’s night when he threw up a shot as the shock clock expired from almost 40 feet that banked off the backboard and fell. He knew how vital it was to put what happened to the team on Saturday behind them. And that confidence is of the most importance right now as Clemson continues to try and climb out of the hole it has dug itself in during conference play. The Tigers have two of their next three games at home, including an important one against No. 12 Virginia Tech. But for now, Clemson will have the chance to take a step back from the court and take a deep breath after getting itself back into the win column. Maybe the struggles in the early-conference slate made this team better. Clemson just has to keep making shots. Simple. “Our guys have a lot of pride. They’re trying, Brownell added. “We have competed hard in several games, but just haven’t been able to quite get it done.